The US Traveler New Yorker Luggage has been designed to be functional and innovative. They have been constructed from a durable and tear-resistant polyester, ensuring that your baggage stays as your trusted travel companion for longer. The three upright suitcases can be expanded an extra couple of inches, allowing you to pack more of your belongings without the worry of running out of storage space. With the numerous interior and exterior pockets on all four of the cases, you will find it easy to pack and unpack, making your travel a breeze. The carry-on tote bag, which will slide under the seat in front of you, will ensure that you can work while on the move, allowing you to efficiently work while in the air, so there is more time when you arrive at your destination to relax and enjoy yourself. 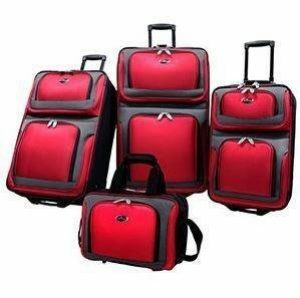 The US Traveler New Yorker 4 Piece Luggage Set is a large and spacious luggage set, designed to be the one purchase that all modern day travelers need to make. The tote bag is an under-seat bag, designed to be taken on board with you while being able to hold your work, a laptop or notebook, and your travel essentials. On the outside of the tote bag, there is one large front zip pocket, giving you the ability to store your travel documents, so they are easy to reach at all times throughout your journey. Inside you will find a large main compartment, accessed by a top zip. There is enough space inside to store notepads, folders and files, and even a small laptop or notebook, making sure that your time traveling is not wasted. 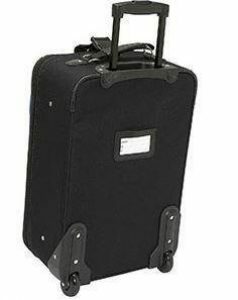 The three upright suitcases each contain two front pockets, one small pocket towards the top of the suitcase, and one larger one towards the bottom. By having two pockets, instead of one, on the front of a suitcase, you do not need to search for too long to find anything that you put inside. Your passport and boarding card can be placed in the top pocket, with no worry about it falling all the way to the bottom of the pocket, making it difficult to retrieve. 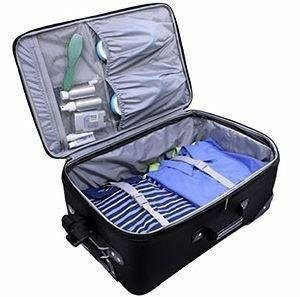 Inside the upright suitcase is the main compartment for storing your clothing, the two tie-down straps will keep your clothing secure and compressed so that your suitcase is neat and tidy. The interior zip lined pockets will give you the ability to organize your belongings and ensure that all loose items stay secure, leading to a much easier and stress-free journey. 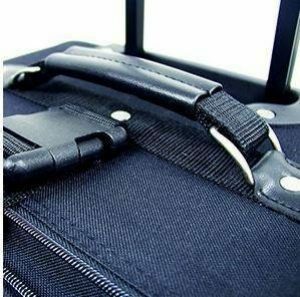 The three upright suitcases come with the ability to expand an extra 2 inches, now there is no need to place unnecessary stress on your zippers by over packing your luggage. 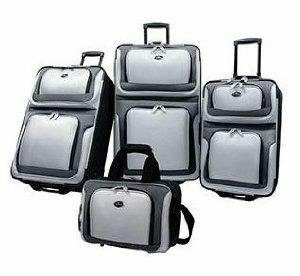 The US Traveler New Yorker 4 Piece Luggage Set comes with most of the features that you would want on a suitcase set. 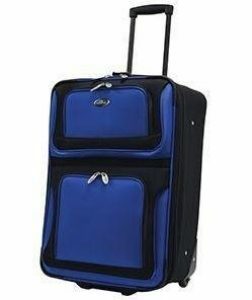 The suitcases come with a telescopic handle and inline skate wheels, in comparison to the 360-degree wheels that are used on the American Flyer Astor 5-Piece Spinner Luggage Set, the inline skate wheels are more difficult to use and are not as maneuverable. However, it is worth noting that as the wheels are inline skate wheels, they are sturdier and more durable, ensuring that it continues to function as expected. There are multiple interior and exterior pockets in all the cases so that you can stay relaxed and stress-free, as you know that your luggage is well organized. 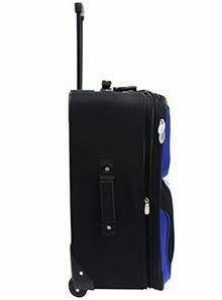 On the upright cases, there is an adjustable add-a-bag strap, which allows you to travel with an additional bag to be carried along without much effort at all. The material that US Traveler has used in the construction of the New Yorker set makes sure that the bags are durable and lightweight. The tote bag weighs in at 2 lbs, which is considerably lighter than a lot of other similar bags. The carry-on upright suitcase weighs in at 7.7 lbs, although not the lightest if you consider the features that this case has, it does make it understandable. The medium suitcase weighs in at 9 lbs, and the large at 11.8 lbs. 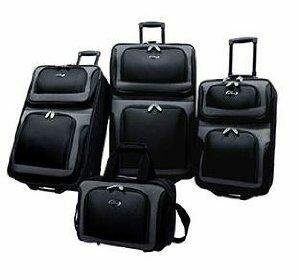 In comparison to the Fochier 6 Piece Luggage Spinner Set they are considered to be much heavier. Although, when you look into it a bit more, the size of the suitcases and the storage available does not make them that much heavier in proportion. If you are traveling with a larger, heavier bag, get in touch with your airline carrier before arriving at the airport as you do not want to exceed the restrictions in place and be forced to pay hefty fines. The New Yorker suitcase set has been designed to be lightweight, affordable, and durable. With decisions being made on the fabric and features to ensure that they do last a long time. Customers have noted that the zippers can become stuck and prone to fail, rendering the bag useless. Be careful not to overpack your suitcase, as this will place unnecessary stress on your zippers, resulting in them failing, which may not be covered under the warranty. The fabric is made from a durable polyester, ensuring that it does not rip or tear easily, as you do not want to be in a position where your clothes are falling all over the airport terminal, as you try to rush to your gate for the final call. 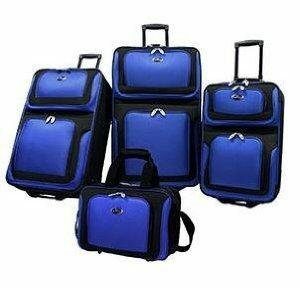 The US Traveler New Yorker 4 Piece Luggage Set has been designed with the classic luggage style about it. It is not a head turner and it will not win any awards for best-looking suitcase set. It does its job, it is fairly pleasant on the eye, and you will not bring any unwanted attention when using this set. Available in five different color combinations, you will be sure to find one that you like, but probably not love. The New Yorker set is a classic-looking suitcase, but not as stylish as the Rockland Luggage Varsity Polo Equipment 4 Piece Luggage Set. The tote bag measures in at 15 x 10 x 7 inches, which will fit under the seat in front of you, without any problems. The carry-on upright suitcase measures in at 21 x 13.5 x 8 inches, which is within the size requirements at the moment, although if you do expand it, be sure to check the expanded size with your airline carrier. The medium suitcase measures in at 25 x 15 x 9.5 inches, and the large at 29 x 17 x 10.5 inches. All the suitcases are fairly big, especially with the ability to expand a further 2 inches. You will easily be able to store everything you need for your trip inside. When not in use, they will store one inside the other, making it easier and less hassle to find a storage spot in your house. The US Traveler New Yorker 4 Piece Luggage Set comes with a 5-year limited warranty, which will cover the bags in case of any manufacturing or material defect. It is worth noting that it does not cover any excessive use, wear and tear, or mishandling. As with most of the US Traveler New Yorker luggage reviews, it is a budget-friendly suitcase set that will not really surprise you.  It does its job fairly effectively, and as you have four pieces, you are not paying for any extra bags that you may not use which sometimes come with these sort of sets.